Are you looking for a fun way to market your brand, products, and services? If you are, we can tell you what exactly you need to hand out to your customers when Halloween arrives. Our Silver Reflective Ghost Bags, with their ghost design, will become a hit with your customers. Our silver and shiny courier bags provide you with sufficient space to place your artwork and business details. Most importantly, young children will absolutely love the design, featuring a ghost and a pumpkin. 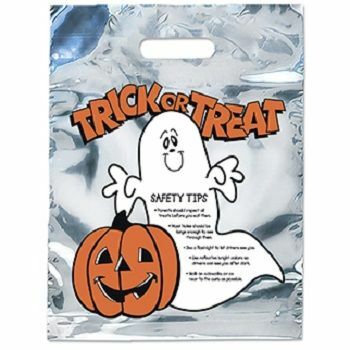 If you want to promote your brand in a fun way and maintain the Halloween spirit, you need to get our consolidated bags. Since our bags shine and glisten in the light, you can place them in your store under the light. Our Silver Reflective Ghost Bags will paint your brand as a child-friendly business and create a good impression amongst parents.